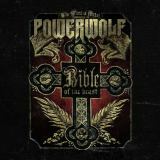 POWERWOLF - BIBLE OF THE BEAST LTD. EDIT. (CD+DVD DIGI) | Online Shop | Wizard LTD. Album: "BIBLE OF THE BEAST LTD. EDIT. (CD+DVD DIGI)"
"The wacken worship – Live at Wacken open air 2008"